The minute Labor Day was over, the skies took a look at the calendar, noticed the date and opened up like a … well I can only think of closing and locking similes (doors! prison gates! ), so just complete that brilliant and witty sentence for yourselves. Anyway, farewell, summer. You were a good summer, full of sunny days and beaming rays of sun. We definitely got our Vitamin D this year. And, more importantly, so did the veggies. The best part of summer is obviously the veggies (beach shmeach), and until the plants get the memo that summer is over (shhh, let’s just tell them that the torrential thunderstorm and dropping temps are a fluke) I strongly suggest that you join me in soaking it the heck up. Farmers markets and CSA boxes (or, you know, grocery stores) are still bursting with eggplant, which is at its peak right now and is, in my opinion a perfect transitional vegetable to tide you over between seasons. It’s starchier than peak summer veggies like, say, zucchini, but not so hearty and rib-sticking that it will keep you too warm, like…. pumpkin. Sorry, but I haven’t come to terms with pumpkin yet. Let’s stick with midweight starchy vegetables for the time being. 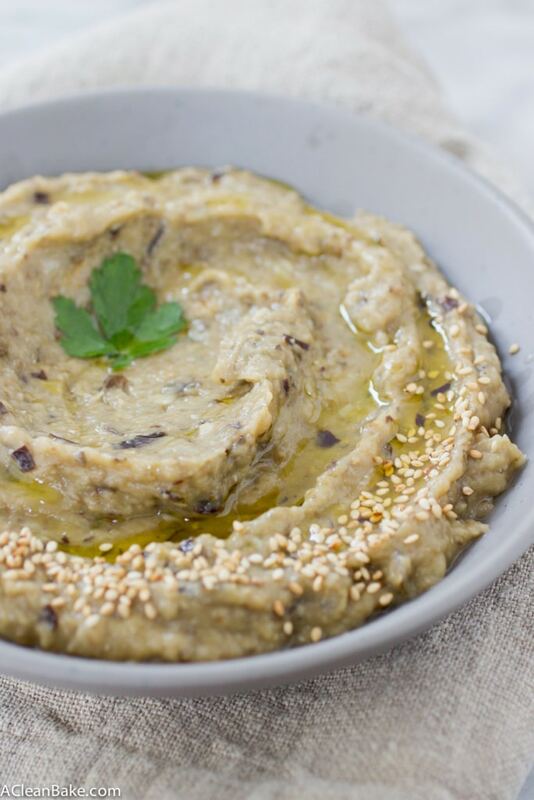 Eggplant and all it’s (just enough) starch roasts up so well in an oven with a bulb of garlic (fallish) but is then blended into a paste and served at room temperature with cold raw veggies, chips or pita (summerish). Babaganoush is one of those dishes that you can make in a big batch – partly as a coping mechanism as you come to terms with the onslaught of pumpkin – and freeze for the depths of winter when you can’t possibly grasp the premise that you may ever be able to exit your home without 2 pairs of socks, 3 layers of top and a jacket that would make an Eskimo sweat. 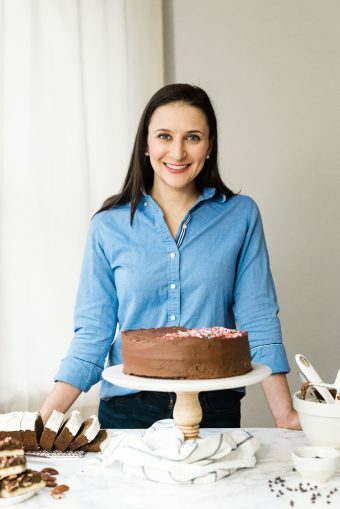 Those kinds of freeze-to-suspend-summer recipes seem to be the only thing I’m interested in making right now, as the conclusion of summer always feels like a slow walk to the (very, very cold) electric chair, so you may as well just lean in. Preheat the oven to 350F. Lightly grease a baking sheet or line with a nonstick pad or piece of parchment. Wash the eggplant. Slice off the ends, then slice it in half lengthwise. Place the eggplant halves open side down (skin side up) on the baking pan, at least 1" apart. Also place the garlic bulb, cut side up, on the pan. Roast for 60 minutes until soft and tender. Place the pieces in the bowl of a food processor fitted with the "s" blade and pulse several times to chop the eggplant. Add the cloves of the roasted garlic (see note) and the olive oil, salt, and lemon juice and puree until smooth, or desired consistency. If you'd like a very smooth babaganoush, make sure you scoop the seeds out and separate the innards from the skin (discard the seeds and the skin) before blending. Personally, I prefer a chunkier dip, and I think that's more authentic - plus I'm lazy - so I throw the whole thing, skin, seeds and all, into the food processor. The easiest way to get the garlic out of its husk is to squeeze gently from the bottom like a tube of toothpaste; if that doesn't work, use a butter knife to pull it each clove out of its little shell. Don't worry if a bit of the husk gets into the food processor. If you'd like your babaganoush to be a little bit sweeter, add 1-2 large tomatoes (washed, hulled and sliced in half) to the roasting pan, and throw them into the food processor with the eggplant. Keep an eye on them, though, as they may need less time in the oven than the eggplant, depending on their size. If you'd like your babaganoush to be a little creamier, add 2-4 Tablespoons tahini (sesame paste) with the ingredients in step 7. Leftovers keep well in an airtight container in the refrigerator for up to 5 days, or in the freezer for up to 3 months. A slow walk to the very cold electric chair – ha! It does feel that way but honestly I’m one of these weird people who enjoy winter. I also enjoy babaganoush and roasted garlic. I can’t imagine how they must taste together! I’m going to miss the summer, too…the weather was so great this season and I hate to see the blue skies go. It’s been far too long since I’ve made babaganoush (like 3.5 years) and all this talk of eggplant is making me seriously crave it! Thanks for the inspiration, m’dear! This looks delicious and your presentation and photos are stunning- pinned! Aw, thanks, Medha! I appreciate you sharing it! hi Nora. Thank you for yet another great recipe. I am just wondering one thing. How does the roasted garlic play into this recipe? Do you blend it in with the eggplant? Should the skins be removed first? Is the garlic just for aroma while baking and should then be eaten on it’s own later? You don’t mention what to do with the garlic after it is roasted. Any additional info would be helpful. Thank you. Thank you for getting back to me so promptly. I thought that the garlic should be tossed in, and your response cleared up any doubts about adding the garlic. I have gathered my ingredients and will be making it tomorrow! Cheers. I just love babaganoush; I can’t believe I’ve never made it before! Right? It’s hard to resist when you learn how simple it is to make! Can’t wait to try! Practicing saying “babaganoush” with a three year old is a riot! Oh my gosh, that sounds adorable!! This looks incredible!! 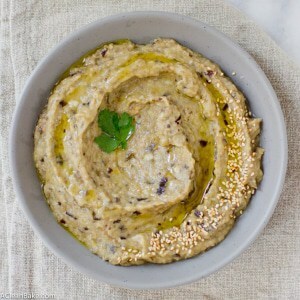 As much as I love hummus, I can’t believe I’ve never made babaganoush! 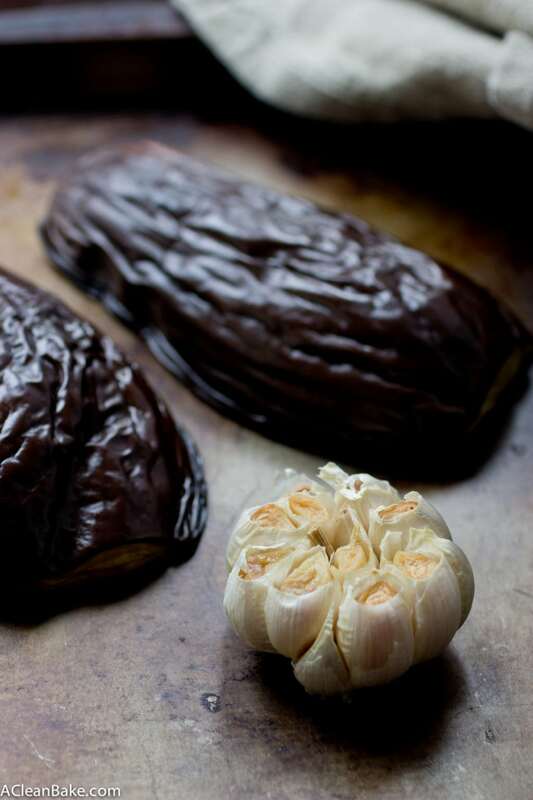 Since my recent obsessions are eggplant and roasted garlic, this is perfect. Can’t wait to try it! So perfect! I hope you enjoy it!! I think that hummus gets all of the attention, but this is a similar middle eastern starter or side dish to dip bread or veggies into! It is also a lot lighter than hummus (partly because I don’t add tahini, which some people do) – so you can eat more! Heey Nora! 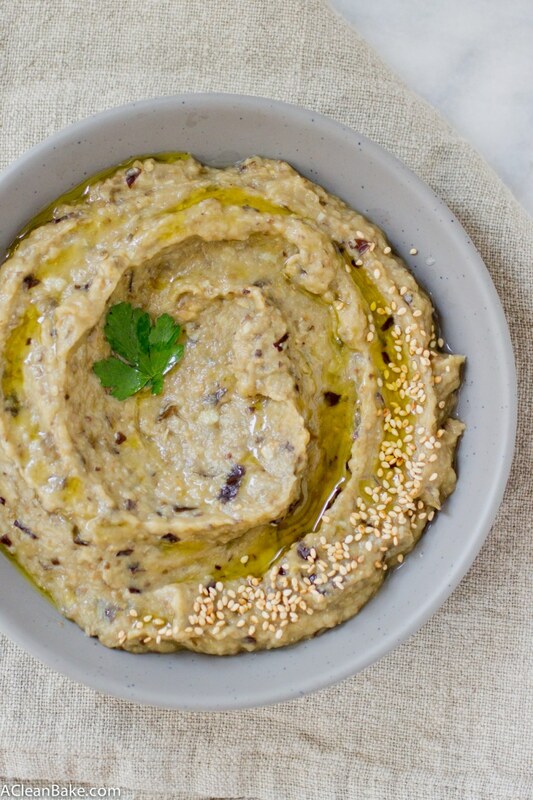 Just whipped up a batch of your babaganoush for an appetizer! I left the skin on 1/2 the eggplant and loved the texture it imparted in the spread. Thank you for this my dear! Delicious! Hi Traci! That’s great to hear! I am so glad you enjoyed it. Thanks for letting me know! Happy holidays!